Ever wonder what it would be like to drop everything, professionally, and volunteer? Elise Mudd, 33, knows. It was only two years ago that she left her career as a Washington, D.C. paralegal. Exiting a job she’d been immersed in for nine years was tough, she said, but she wanted to meet new people and experience a new city. Mudd joined the Jesuit Volunteer Corps, an international, Catholic service program based in her hometown of Baltimore. The JVC sent her to Raleigh, where she volunteered at Catholic Parish Outreach, the largest food pantry in eastern North Carolina. Interestingly, that volunteer experience led her to a new, professional opportunity. Catholic Charities of the Diocese of Raleigh recently named Mudd program director for the new Durham Community Food Pantry, which opens later this year. NC Catholics sat down to talk with her about her background, new role and what pancakes have to do with it. NC Catholics: Tell us about your new role. Elise Mudd: [As] program director for the Durham Community Food Pantry, I’m working on the build-out for our new location, and talking with contractors and service providers to get everything ready. I’ve been working with local churches and other organizations to find volunteers … and set up food drives. I’m also looking for partnership opportunities with programs that can offer referrals. NCC: You had the opportunity to serve Catholic Charities as a member of the Jesuit Volunteer Corps. How was that? EM: Wonderful. I was a full-time volunteer at CPO… Monday to Friday. I distributed food, worked in the warehouse and interviewed clients. I got to know all the volunteers and met a lot of the clients. I loved the work they did and the atmosphere they provided. 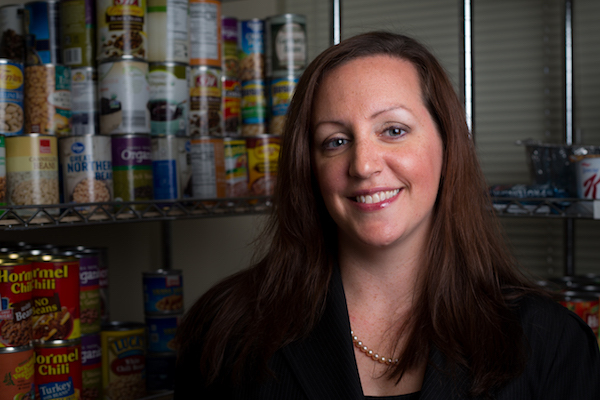 NCC: Did you ever imagine being the director of a food pantry? EM: Oh no … but [as a volunteer] I was inspired with all the work that CPO in Raleigh does for people in Wake, Johnston and Franklin Counties. They give such good food, and so much produce and meat. Someone at Catholic Charities mentioned that they were doing a food pantry in Durham, I just thought it was such a wonderful idea to bring that to the families in Durham County and Orange County. The power of food-banking is our ability to bring people together … and scale our resources to have tremendous impact. NCC: The Durham Community Food Pantry is set to open before the end of the year. What are you most looking forward to? NCC: How are you overcoming that fear of the unknown? EM: Prayer. I am also leaning on the support that I have from Terry Foley (former CPO director) and Kelly Rappl (current director). They have been huge supporters … and the people we have in Durham – Barbara Mazza and Jeremy Ireland and Warren Harris – have been a great support, too. NCC: Why is fighting hunger important to you? EM: It’s a problem that shouldn’t exist. In Durham County, one of four of children doesn’t always have a meal on their table each night. There is a one-million-pound food shortage in Durham County and a half-million-pound shortage in Orange County. We are expecting to serve 4,500 people each month. Also, in my family, life is centered around food, cooking and feeding people. My grandmother helped at her church. I remember my mom and dad cooking for church events, like a pancake breakfast. And there was an Italian dinner that my dad did once a year at the church’s bazaar. NCC: How will the Durham Community Food Pantry operate? EM: Every client must have a referral from a social service agency or a church. The referring agency must complete the information that’s provided by the client and we’ll assist the client by providing the food. Once they arrive into our office, they will sign in with our greeter and have a short interview. Volunteers will pack rice, beans, pasta sauce, cereal, cheese, daily items, fresh produce, frozen items, bread and dessert. We’ll be serving clients Monday to Saturday from 10 a.m. to 1 p.m.
NCC: For those who wish to help, how can they get involved? EM: Many ways! They can volunteer … in the front of the house or in the back helping us pack food. They can come in groups or by themselves and volunteer as often as they like. People can participate in food drives … or donate to the food pantry so we can purchase the food.